Each year, schools spend tens of thousands of dollars on paper towels for bathrooms and classrooms. Electric hand dryers in each bathroom would be the ideal way to go green. Hand dryers and paper towels both consume energy, but automatic hand dryers have a smaller environmental cost. Manufacturing paper, packaging it and transporting it from mills to schools uses energy. Rooms with paper towels need to be cleaned more often, and discarded paper must be sent to landfills. 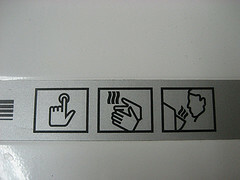 Hand dryers, by contrast, use energy during their manufacture, and once installed, only consume energy during drying. Various studies have found hand dryers to have a smaller impact on the environment than paper towels. The Stamford school system is planning to run a pilot test of electric hand dryers in teachers' restrooms.